Why is our city being overrun by weeds? Especially kudzu? Anytime my wife and I go out for a run or walk through town lately, we notice that weeds and grass are sprouting up everywhere. Up until about a week or so ago one could barely navigate the riverwalk where it passes underneath Bibb Graves bridge because the walkway was practically covered in kudzu. In fact, there are several places along the riverwalk where weeds and very high grass not only obscure the view of our beautiful river but provide a perfect place for snakes and other critters to hang out. I don’t know about you but I’m not fond of having a haven for these slithery ne’er-do-wells so close to where lots of people, namely me, walk, run, ride bikes, and push strollers. It’s not only on the riverwalk but other places around town, too. Drive around a little and you’ll likely see what I’m talking about. I do realize that the kudzu in the bridge area was just cut back, but if you are familiar with kudzu you know that it grows at a rate of about 17 feet a day(that’s only a slight exaggeration) and it won’t be any time before the bridge is covered in fuzzy, itchy leaves again. I know that several city council meetings back, there was some discussion about spraying these areas so that they aren’t such an eyesore and overall nuisance and, make no mistake, they are an eyesore. What I have heard second-hand is that at least two city council members were vehemently opposed to spraying these areas to kill the weeds. I’m not sure what their reasoning is but unless it’s going to cause the river to dry up or kill any living thing that may come into contact with whatever chemical kills the weeds then my vote goes to spraying it. Maybe some of you who were at the meeting in question can fill the rest of us in on why The City of Natural Beauty is becoming a little bit too natural. I think it was Councilman Greg Jones who brought up the need for getting rid of these weeds. Let me know if you can provide more details. Which reminds me, I need to trim my shrubs Saturday. Anyone who wants to help can come on over at your leisure. On an unrelated note: If you haven’t checked out The Wetumpka Herald’s new website, you really need to. It has a ton more content than it did before and has now become a daily destination for me. Kudos to everybody at the Herald for making the changes! Kudzu is a huge problem in southern states, and a constant headache to the Dept of AG. It takes years to eliminate a kudzu infestation. It has to be removed at the root ( dug out ) or a very strong herbicide must be applied routinely for years. The herbicide will not work unless the kudzu is treated at all connecting locations. If the city treats the kudzu on its property but it connects with kudzu on private property that is not treated . It will grow right back. it will also grow a new root system and return if it is cut out on the city property but not private property. 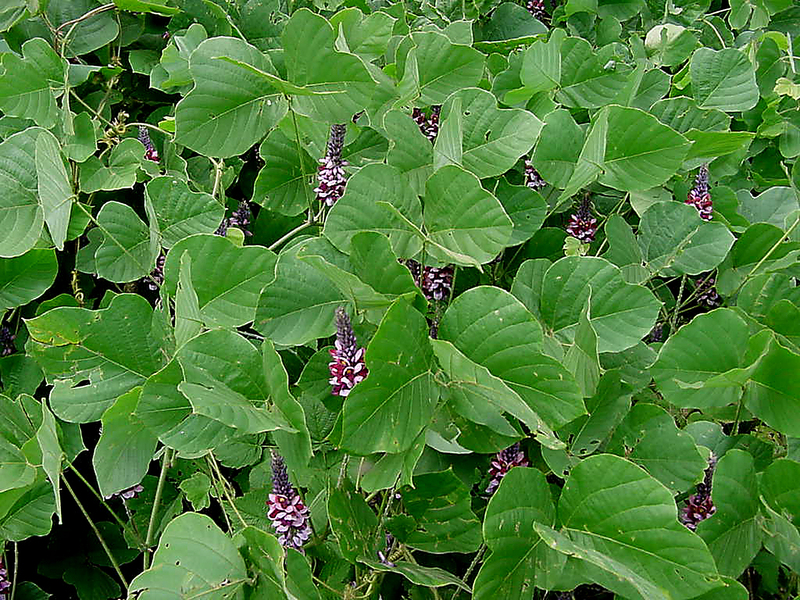 Also the herbicide used to treat Kudzu kills many other types of plant growth. Its carried in rivers and streams and leaks into ground water. The negative side effects of treating kudzu outweigh the benefit, it will cost the city an arm and a leg to repair the damage that will result from killing off vegetation needed to prevent erosion. The only real option is to cut it back as much as possible! That explains the kudzu part. It isn't only kudzu, though. In fact, in some places it's just very, very high grass that hasn't been maintained. This has been an issued in the medians in town as well. My understanding is that whatever spraying was going on was stopped at the behest of some on the city council who felt strongly about it. I don't want to cause irreparable harm to the ecosystem here in Wetumpka but neither do I want to have to don my jungle safari gear and a machete every time I go out for a little exercise. There has to be some middle ground somehow. Maybe we could just tie some goats in the areas in question and let them take care of it. You know…its actually an option. They did that in Chattanooga, employed a goat herd to eat the kudzu. They had to use guard llamas to protect the goats from wild dogs though. I SWEAR im not joking. Im going to find the link and send the article to you.Goats as city employees.Guard llamas.For real. That is great. I love it. I'd much rather have goats and llamas than spiders and snakes any time. Goats do have sort of demonic looking eyes but other than that they can be great fun.